In our thoroughly postmodern age, the willingness to reinterpret older, much-loved characters have reached fever pitch. It doesn’t always work but when it does, it can be sublime, opening a whole new perspective on characters we’ve grown up, elasticising their personas so they fit quite snugly into our 21st century sensibilities. DC Comics have been having a fine old time of it lately, re-imagining a slew of Hanna-Barbera characters such as The Flintstones – to enviable success; the literate, beautifully drawn rumination on modern materialistic lifestyles has garnered much acclaim – and Scooby Apocalypse, an altogether darker take on good old goofy Scooby Doo and the gang. 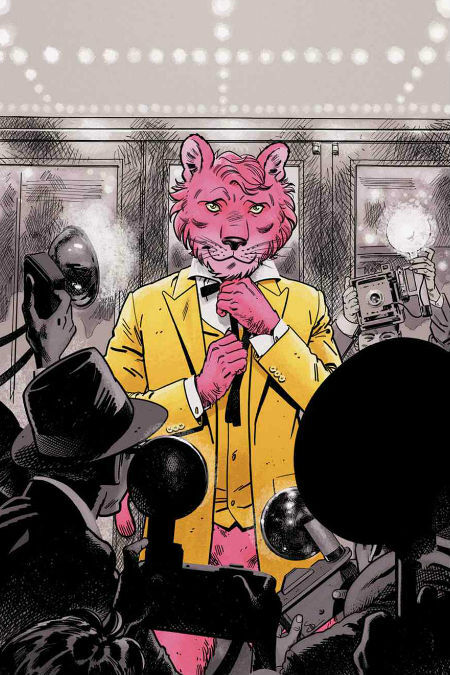 Now the writer who gave us the inestimable delights of the new grittier The Flintstones, and artist Mike Feenan, is back with another take on our modern world, this time courtesy of Snagglepuss, given a Tennessee Williams makeover circa 1953. Exit Stage Left: The Snagglepuss Chronicles #1 releases January 2018.